Most of the internal combustion engines you see on the road today are built using the standard principles of the piston engine. However, this isn’t the only internal combustion engine out there. The rotary engine—often called the Wankel engine after its inventor, Dr. Felix Wankel—is a powerful alternative to the piston engine and an important part of Mazda’s signature performance heritage. The rotary engine works on the same basic principle as the piston engine: combustion in the power plant releases energy to power the vehicle. However, the delivery system in the rotary engine is wholly unique. The piston engine performs four key operations: intake, compression, combustion, and exhaust. The rotary engine performs each of these key operations as well, but it does so in a completely unique way. In the case of the rotary engine, each of these key processes is handled by a separate housing section of the powerplant. The rotary engine is made up of several key components. When you see the rotary engine for yourself, it will be clear how different it is than your typical piston engine. The Rotor: The three convex faces of the rotor act in a similar way to a piston, but the rotor is mobile, moving in a path through the housing delivery system of the engine. The Housing: Shaped like an oval, the housing has several different parts that are responsible for intake, compression, combustion, and exhaust. Output Shaft: This long cylindrical tool is built offset from the centerline of the shaft. Each of the engine’s rotors is placed over the lobes of the output shaft to make it spin. The amount of spinning performed by these lobes determines torque by the amount of force placed upon it by the rotors. Mazda established itself in the 1960’s and 1970’s as the leading innovator when it came to the sophisticated development of the rotary engine. The Mazda pioneering tradition wrote itself into history with a number of popular models powered by the rotary engine, including the Mazda RX-7 model that went on sale back in 1978. 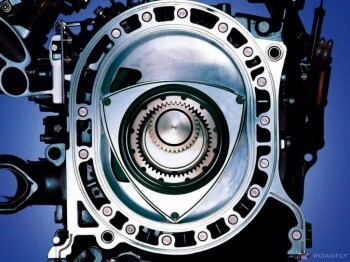 While Mazda stopped the sale of the RX-7 back in 1995, current developers and engineers at Mazda have recognized the unique possibilities presented by the rotary engine. Get excited for a resurgence of the rotary engine by Mazda engineers within the next few years!